The London Eye offers a fantastic panoramic view of England's capital city. 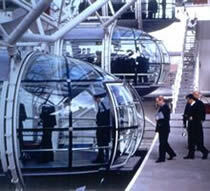 It has become one of London and the UK's most popular attractions in a very short time. Originally built to celebrate the Millennium, it has become a permanent fixture on London's South Bank, opposite the Houses of Parliament. The Eye takes you on a gradual, 30 minute, 360 degree rotation that will give you the kind of panoramic views usually only accessible by helicopter or aeroplane. From The Eye, you are able to view London's churches, monuments, and palaces. The view from The Eye even allows you to see as far as Windsor Castle, 25 miles away, on a clear day and is the best way to see all of London and its landmarks in one go.